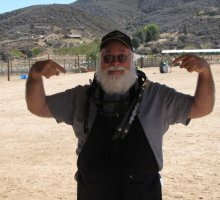 We needed Noah to bring his ark to the Antelope Valley and dock at the Lucky Ewe to have a chance to get the test classes in on Saturday as the heavens opened with a deluge of rain at about 4:30 p.m. Saturday just as the Started B Course was finishing on Saturday. Unfortunately Noah was not in the neighborhood and the test classes will double up on Sunday. Before the gully washer we did manage to complete both A and B courses and there were some wonderful runs turned in which were rewarded with scores in the high 90s. 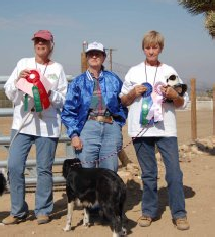 High in Trial in A Course went to Border Collie Meg, owned by Suzanne LeRoy and handled by Molly Wisecarver in the Started Class with Reserve High in Trial going to Dashiell owned by Nancy Levondosky and handled by Robin Penland Elliot with a tie of 97.5 points (actually a 3 way tie broken on time). On the B Course High in Trial went to the Intermediate Class and Yoko, bred, owned and handled by Suzanne Anaya with a near perfect run of 98. Reserve High in Trial went to Border Collie Rain owned by Suzanne LeRoy and handled by Molly Wisecarver from the Advanced Class. Derek Fisher Clinic A Success. 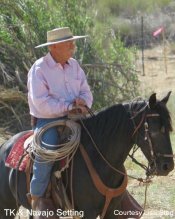 The Lucky Ewe was transformed to a large outdoor classroom over Easter Weekend as we were privileged to have a clinic conducted by Derek Fisher. 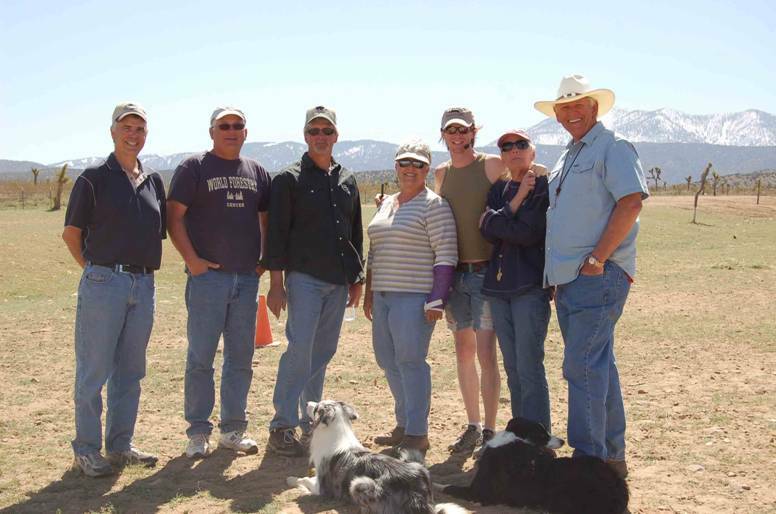 Derek and the Clinic participants both enjoyed the hospitality of Sally Douglas at the Lucky Ewe and the universal reaction form attendees was that the weekend was a very valuable learning experience. The Derek Fisher Clinic was held Easter Weekend at the Lucky Ewe Ranch. Despite the unfortunate scheduling to coincide with a major religious and family holiday - that will teach us to only consider dog trial schedules when setting future events - we had a nice crowd. Attendees came from as near as Phelan and as far as the Olympia Peninsula n Washington State. Derek was great and spent a large amount of time with each working dog, Universal reaction from attendees was highly positive and several expressed interest in trying to take continuing lessons from Derek (more below). Special thanks go to Sally Douglas for the generous use of the Lucky Ewe, Kathy Roberts for her (as per usual) wonderful cooking, Ted Ondrak for his help with set out and use of his public address system, and Michael Burks for general work around the ranch painting and fixing pens and drive panels, and of course, Derek Fisher for his patience with everyone and wonderful clinic. 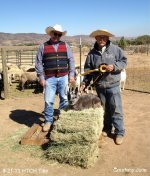 Because of the interest expressed in continuing lessons, we spoke to Derek about coming out to the Lucky Ewe on a regular basis for lessons. 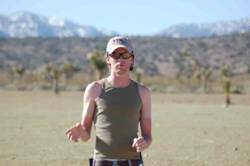 Derek has agreed to do this and we are working out the final details but lessons could start as soon as the weekend of March 29 - 30. At the moment we are talking to Derek about a possible series of group lessons at a special rate as well as private lessons. 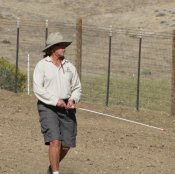 Although only a small contingent of Antelope Valley Members trekked North for the February SJVBCA Fun Trials in Porterville it was a productive trip. Sally Douglas took first place on Saturday and Sunday in Pro-Novice with Babe. She followed that up with a Saturday First and Sunday Second with Merle in Novice. Pat Grannan and Maggie took third in Novice on Saturday and Fourth on Sunday in a small field. 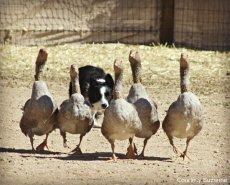 Maggie is still planning that advertisement in Working Border Collie looking for a qualified handler. The big news came at lunch on Saturday with the SJVBCA annual awards. Sally Douglas and Merle took Novice Top Dog for 2007 following in the footsteps of Erin Swanson and Keeler from 2006. In a new and special award Pat Grannan and Maggie were awarded Most Improved. t Place in Started A Course along with Reserve High in Trial on A Course on Sunday. High in Trial went to Robin Penland Elliott and Lass in in Advanced Class A Course with a near perfect score of 99. Full Sunday Trial Results can be viewed by clicking here. The Test Classes were combined to two runs on Sunday for each test class as a result of the late afternoon Saturday rainstorm which forced the Saturday scheduled tests to be run on Sunday morning. After the long wait there were a lot of happy faces with a high percentage of Qualifying Scores. Full Test results can be viewed by clicking here. Full results from Saturday's trial classes can be found by clicking here. More details and photos will follow over the next few days. 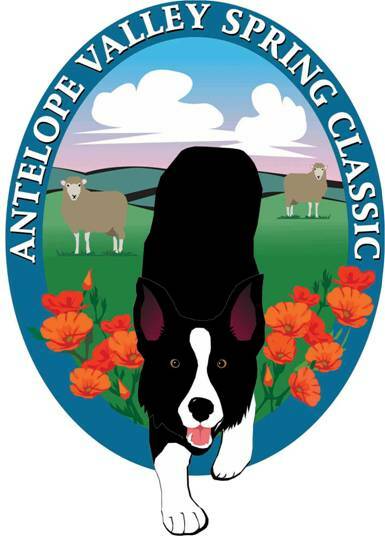 The 2008 Antelope Valley Spring Classic Herding Trial was held at the Lucky Ewe Ranch May 31 and June 1. 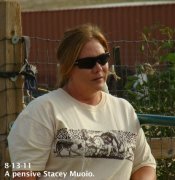 The Second Trial under the AVSC name was actually four official trials over the two days - one "A" course and one "B" course each day. 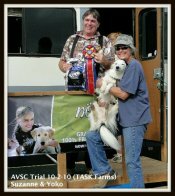 The trial was an AKC sanctioned all breed herding trial offering both Course "A" and Course "B" along with HT and PT Test classes. Eleven different breeds were represented. 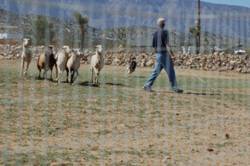 Dogs came from as far as Alabama and Minnesota and as nearby as the Lucky Ewe itself. Robin Penland Elliott and her Border Collie Lass were the big winners over the weekend taking High in Trial Awards in three of the four trial. Belgian Sheepdog Phoebe - owned by Gordon Armstrong and handled by Ted Ondrak - took the other High in Trial on "A" Course on Saturday. Reserve High in Trial Awards went to Border Collie Buster and his person Dorothy Dunlap for Saturday "A" course, Border Collie Merle with Sally Douglas for Saturday "B" course, Border Collie Cameo (from Minnesota) owned by Debra De Gidio and handled by Terry Kinney for Saturday "A" course, and Border Collie Winee owned by Suzanne Leroy and handled by Molly Wisecarver for Sunday "B" course. While an event like the Spring Classic takes hard work from a large number of people special thanks go to club members Michael Burks for an amazing amount of general work and supervison, Ted Ondrak for course direction and stock handling, Erin Swanson and Jean Singer for stock set out, Kathy Roberts for our wonderful art work and lunch, and of course Sally Douglas for putting up with all of us and hosting the event. 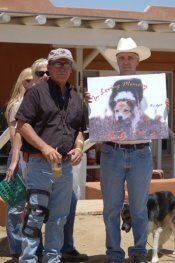 Special thanks also to Robert Schooley for on site veterinary services. We were also fortunate to enjoy the judicial opinions of Ed Faulk on Saturday, Joel Levinson on Sunday, and Peggy Richter and Suzanne Anaya for the test classes (as well as Suzanne Anaya's apprenticeship on "B" course on Sunday). 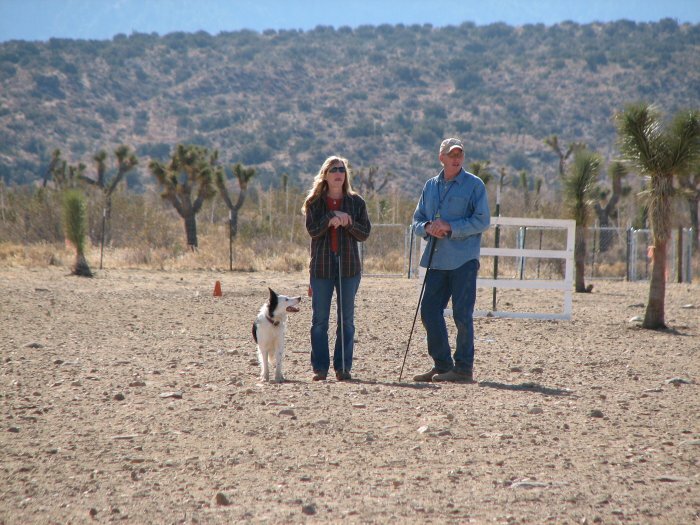 The Antelope Valley Stockdog Club First Annual Fall Classic Herding Trial brought the Antelope Valley Stockdog Club back to life with a "howling" success. It was championship weekend for a mother and daughter pair as Sally Douglas' Babe and Marsha Dales-Bain's Peg each completed their championship over the weekend. Peg finished up her championship in especially dramatic fashion. 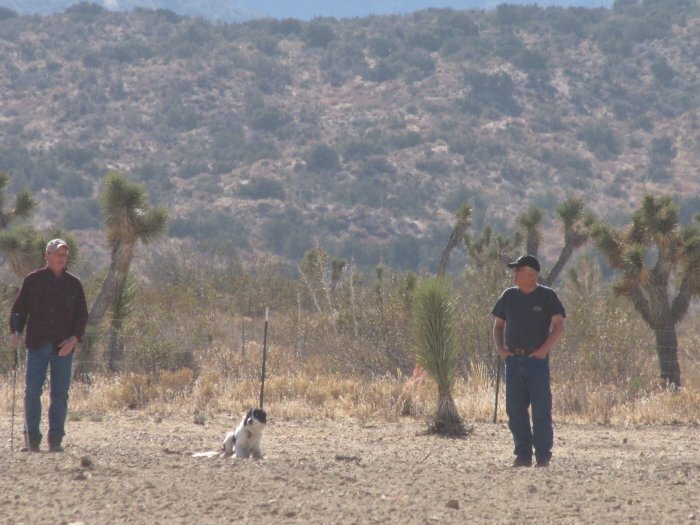 Needing a victory - and not just points - Peg went to the Handler's Post Sunday with her daughter Babe already posting a nearly unbeatable score of 96. "Nearly" was the operative word as Peg laid down a score of 96.5 to knock her daughter down to second place and complete her own championship. 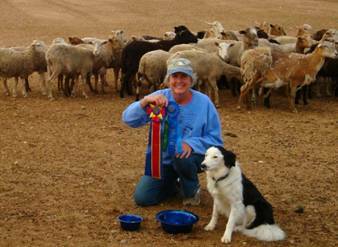 Babe had finished her own championship on Saturday and Peg's run completed the mother-daughter championship weekend. Mike Burks and Sport made their debut in Advanced Class on Saturday and promptly disappointed everybody needing a win for their championship by taking home first prize. 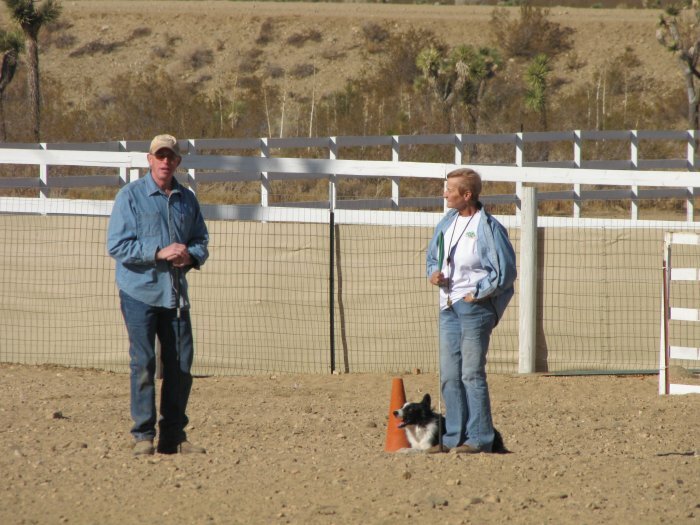 Wayne Anaya also made his handling debut (of any level) in the Advanced competition on Saturday running "Jet" because "Jet's" normal handler Suzanne was otherwise engaged (see below). Although working from a handwritten cheatsheet listing the commands Wayne did a fabulous job -- or is it that Jet just knew what to do on his own. Only the Shadow knows for sure. Resident "Yard Boss" Dollie invited all to enjoy her retirement runs on Saturday and Sunday taking home ribbons on both days in intermediate before trotting off to her retirement on the Lucky Ewe working sheep. "Good Bye, Dolly !! You're looking swell Dolly, you're still going strong." We will miss you in future competitions but know you will keep the Lucky Ewe running smoothly. High in trial went to the started class both days to Belgian Sheepdog Phoebe owned by Gordon Armstrong and handled by Ted Ondrak. Good Job, Phoebe. 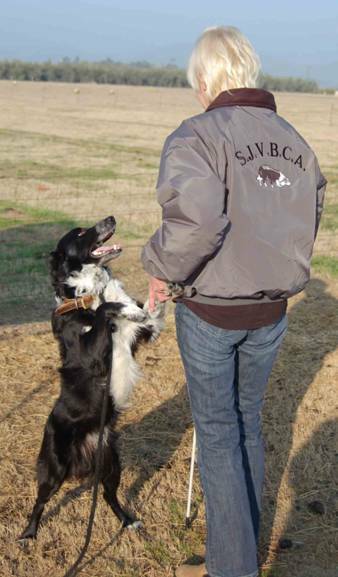 Many dogs earned new titles in both Pre Trial and Trial classes and enjoyed the special lavendar "New Title" ribbons. Special gratitude goes out to Kathy Roberts for the beautiful logo and cooking (esp the famous Brownies), Marsha Dales-Bain for the beautiful ribbons, Erin Swanson and Jean Singer for all around help (especially for the shirts), Ted Ondrak for stock handling, Judy Vanderford and Peggy Richter for judging, Suzanne Anaya for apprentice judgingJan McAninch for her usual flawless job as trial secretary. 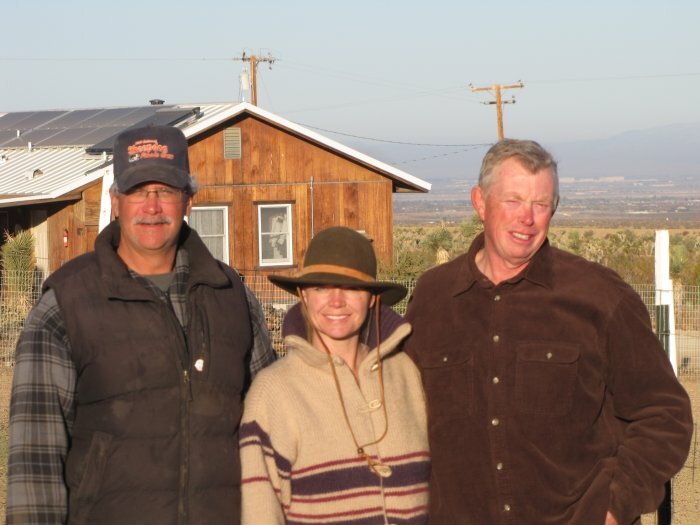 Finally -- although they won't want the acclamation -- we all know it would not be possible without the generosity of Bill and Sally Douglas -- our hosts at the fabulous "Lucky Ewe". We'll do it all again soon. 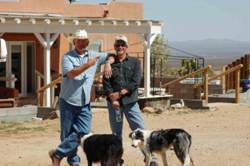 Join us for a good time and some happy herding.